Teams appears to allow for rich interaction, but it might be a bit overwhelming for new users. 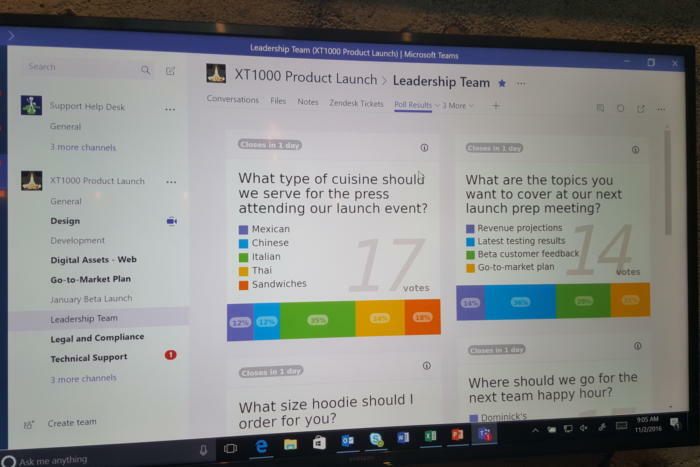 Microsoft’s Teams app reinvents communication and collaboration in a way that’s typically Microsoft: tons of features, numerous options, with some of that complexity unfortunately pushed onto the user. The obvious product to compare Teams to is Slack, which I use daily, or HipChat. Within Teams, users can chat in groups or one-on-one, share files, communicate via Skype video calls, and even interact with bots and third-party apps. By the way, if you thought Microsoft Yammer was Microsoft’s answer to Slack, you’re wrong. 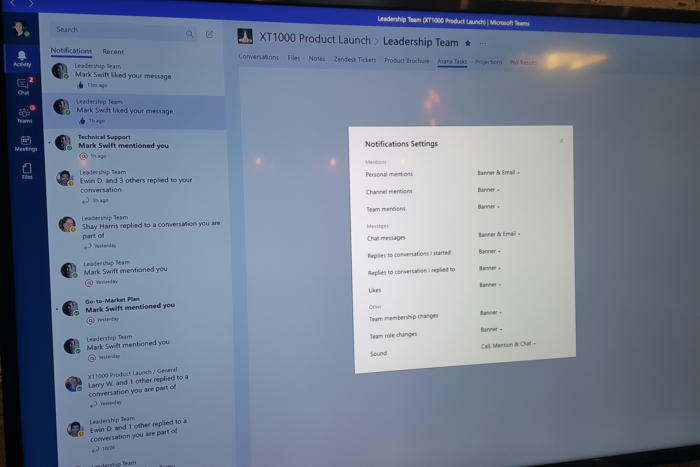 Yammer provides an “enterprise social scenario,” according to Teams corporate vice president Brian MacDonald, while Teams is oriented around one-on-one and group chat. So there. The way Teams organizes information only allows for a topic or two in the main chat window. You’re expected to use the left nav bar to keep track on topics you can’t see. Microsoft’s demonstration dove right into the deep end of the app, which is available in a Customer Preview for Windows 10, Mac OS, the web, and all three major mobile platforms. It’s part of the Office 365 Enterprise and Business offerings, and is included with your existing paid subscriptions. (If you have a relevant subscription, ask your IT admin for access.) Microsoft isn’t charging extra for perks like message retention, so your chats will be archived for as long as your IT administrator chooses to keep them. My initial reaction: “Whoa, this is a little much.” Teams throws a lot of information at you, though its basic UI isn’t that complicated. But it’s the way in which you actually interact with colleagues that becomes…well, Microsoft might call it rich, while others might call it complex. All of the action takes place in a vertical column of “conversations” that dominates the screen, organized by a series of tabs along the top and in the lefthand rail. A closer look at the left nav bar of Microsoft Teams. To the far left are a column of icons that control your view: Activity, Chat, Teams, Meetings, and Files. During the demo I found little difference between the Activity and Teams views, because the majority of interactions in Microsoft’s demo took place between members of the same fictional team. Both Slack and Teams use superimposed numbers to indicate whether there are direct messages or other actionable items that you need to respond to. One of the key differences I saw between Slack and Teams is that Slack places one-to-one chats and group conversations on the left rail, simultaneously; Teams breaks this up into separate views. 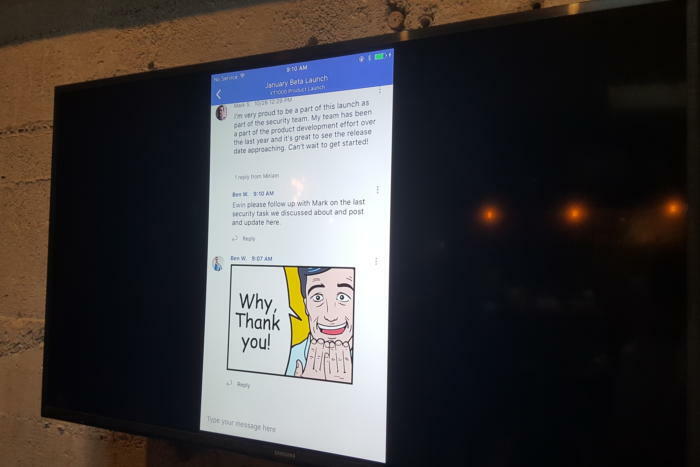 Next, there’s a vertical column of contacts and bots you can chat and collaborate with, as well as a tab for any notifications that Teams has sent you – whether a contact has replied to a message, for example. Teams uses bold highlighting to indicate a group, task, or contact that requires your attention, as well as slide-in notifications. Versions of Teams will be released on all major mobile platforms by the end of this week,Teams corporate vice president Brian MacDonald said. At the top of the page is a horizontal list of tabs that organizes your activities in yet another matrix: conversations (chats), sharing files, and OneNote notebooks, and then any interactions with third-party plugins that your IT administrator may have enabled, such as Zendesk tickets. Once you’ve figured out whom to chat with, it’s time to begin chatting. Teams uses a threaded model for chat, which means that any “topic” can be replied to with additional comments. How you prefer your conversations to be handled can be somewhat personal. Threading allows conversations to stay on topic, though it may sometimes force participants to hopscotch around. 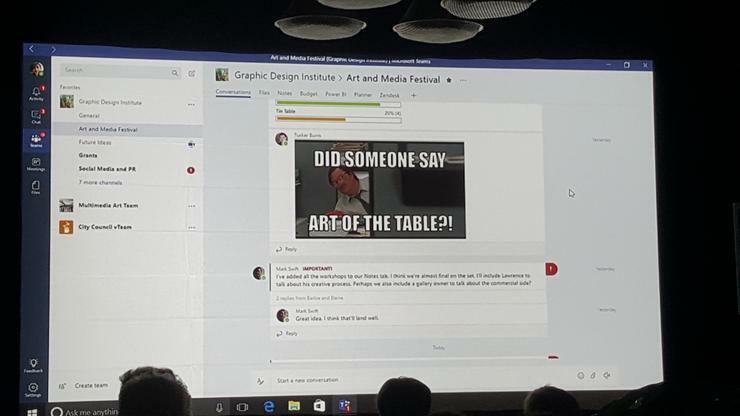 As the screenshots indicate, Microsoft’s default view typically results in having a single threaded topic dominate the screen, though Teams also appears to collapse the conversation if it grows too unwieldy. The Teams notifications settings menu. 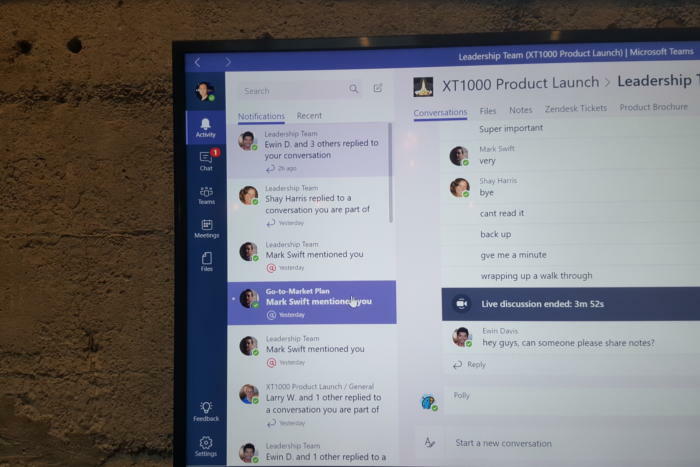 Teams keeps you up to date on the various conversations via various Windows 10 slide-in notifications, or red exclamation-point tabs that sprout from conversation topics. That’s a bit worrisome, because the Notifications settings menu doesn’t seem to allow you to prioritize conversations. Some employees enjoy a steady stream of chatter, while others want to tune out anything that's not directly related to a task at hand. Like Skype, Teams allows you to carry on conversations with bots, including its own Teams bot, creatively named "T-bot." For now, T-bot serves as a sort of glorified helper bot, providing tips on how to format messages, for example. Teams bots can be built on the Microsoft Bot Framework, so expect to see more of these soon. Currently, you can’t open a chat or collaborate with anyone outside the company. Teams corporate vice president Brian MacDonald said that capability will be added soon. 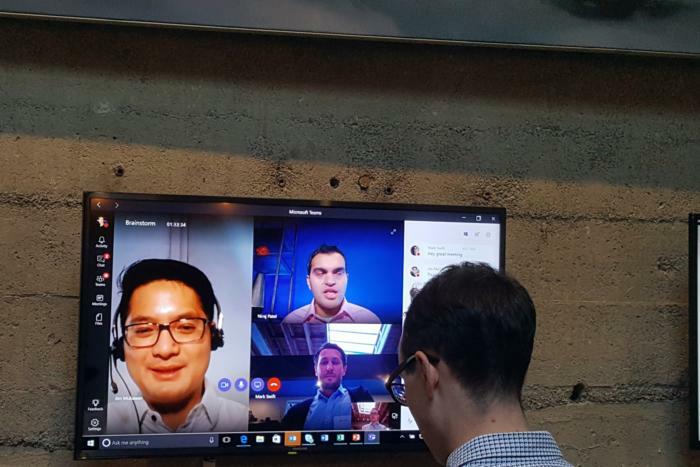 If you need to, Teams can quickly create a group video chat using Skype. Each message can be replied to using plain or rich text, or emoticons—and yes, there’s Giphy support built in for the right GIF at the right time. You can also attach files, and that’s where you can see the Teams’ complexity issue begin to rear its head. If you form a group, each group receives a SharePoint workspace to share files. If you collaborate on a OneNote note, that file will be stored there. Ditto for PowerPoint presentations and third-party files, too. 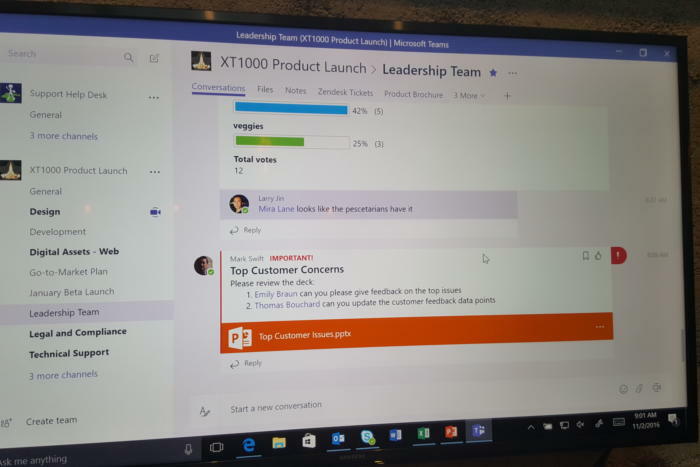 If you’ve already bought into Office’s collaborative message, though, the SharePoint space in Outlook Groups doesn’t carry over, McDonald said. (If you’ve formed a Group in Outlook, Teams will suggest the same group but won’t automatically create it, MacDonald said.) That means that you could be working on shared document within Outlook that you might not have access to via Teams. It sounds like Microsoft will forge stronger ties between its Office apps over time, though, and use Delve’s handy file-finding capabilities to discover what you’ll need. Third-party apps can be integrated within Teams, and some of them look quite nice. To add to the confusion, there won't be a UWP version of Teams for the Windows desktop, even though the Windows Mobile version of the app will be a UWP app. In contrast, a bread-and-butter product like Word has a UWP app to complement the Win32 versions of Office on Windows 10. Microsoft’s goal, MacDonald said, is to create “one hero experience” across all desktop platforms, but we're not quite there yet. It's too early to tell whether Teams will offer any compelling advantage over Slack or Hipchat? I'd need to start fresh with Teams, tracking real conversations and collaborations. MacDonald says the company’s beta customers have welcomed the depth of interaction. If that’s true, then there may be an untapped market itching to migrate off the minimalist interfaces of Teams’ competitors into something richer.